We were recently lucky enough to win 5 Raspberry PIs from the Coderdojo Foundation so figuring out what to do with them was our first challenge. In this post I will detail how I set them up so that the ninjas at the Naas-Sallins dojo could use them to improve their coding skills. They came with Raspbian installed but instructions for getting started with the PI are on the website. Knowing that the ninjas love minecraft I decided to install the special edition for the PI by following the instructions here. 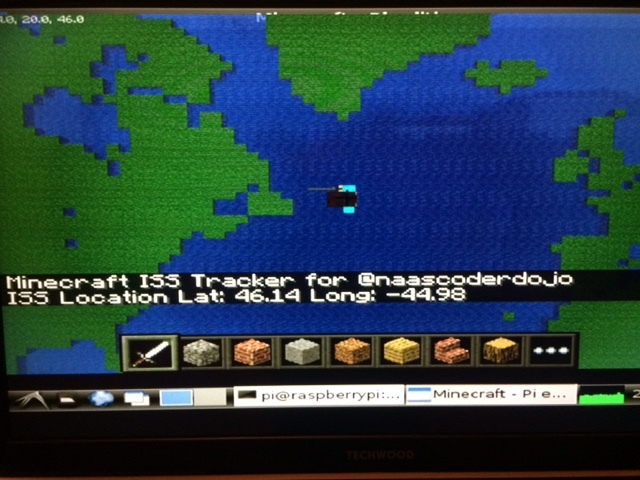 Typically people use python to control the Pi edition of minecraft via its api and there is some great information on how to do that on the Stuff About Code website but after some digging about I found that it would be possible to use the Scratch extension mechanism to allow ninjas access minecraft on a remote Pi from their laptops. The comprehensive instructions are here and you should have a read of them but in general you run a python program which talks http with scratch and translates them to instructions that the remote Pi running minecraft will understand. You then load a .s2e file which adds the minecraft blocks to scratch. So once we got everything working with the mcpi-scratch extension it was time to see how well it works. 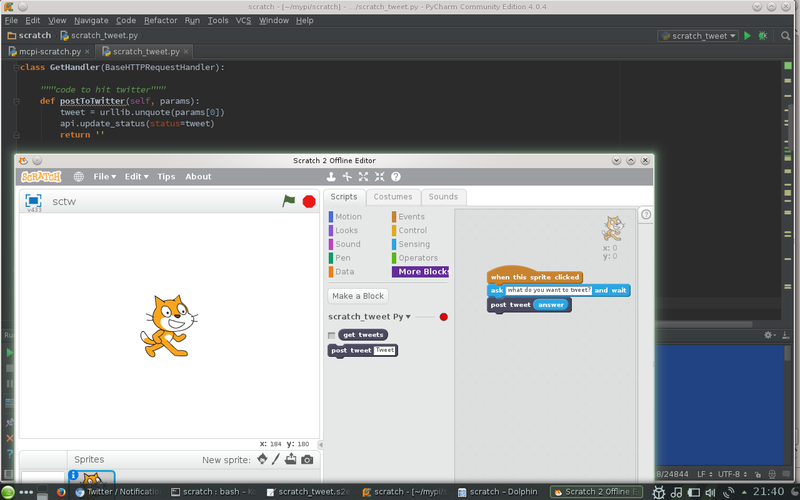 Using Scratch with the mcpi-scratch extension. This screen shot shows the minecraft blocks which are found in the more blocks section and it also shows a couple of the custom blocks that are going to draw the letter they are named after in minecraft blocks. 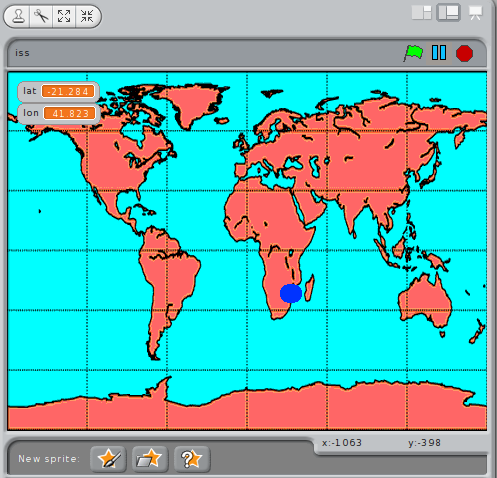 When we run this scratch program with our mcpi-scratch helper application and extension running we get the following result. This just gives a quick idea of what is possible, but the main advantage is that we can have multiple ninjas working on different laptops connecting to a single Pi running minecraft. 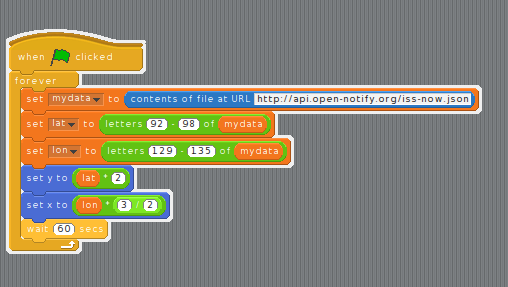 This ability to write helper apps and extensions for scratch open up a wide range of possibilities. 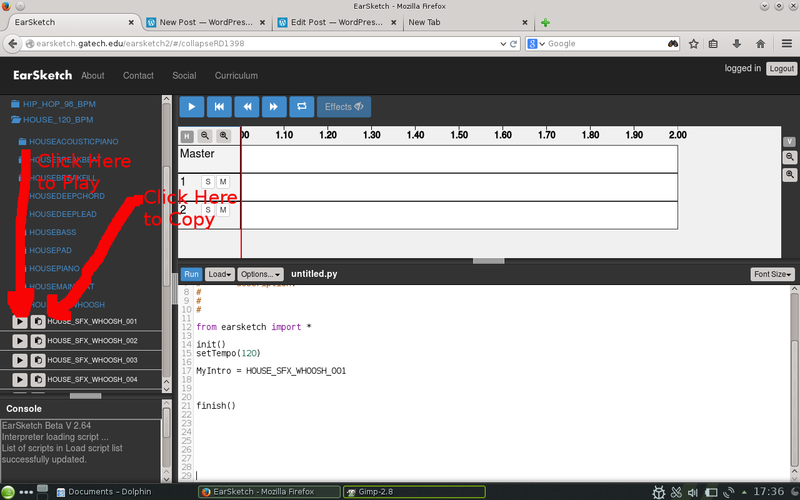 I used the mcpi-scratch.py code as the basis for a quick test to allow scratch to tweet. I added the code from our earlier python program which uses the tweepy library. So now you run the python program, launch scratch, hold down shift and click file and then pick import experimental http extension and open the extension above. The post tweet block should now be available to use. 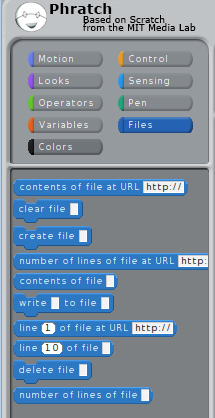 This just shows what is possible with the http extension in scratch. 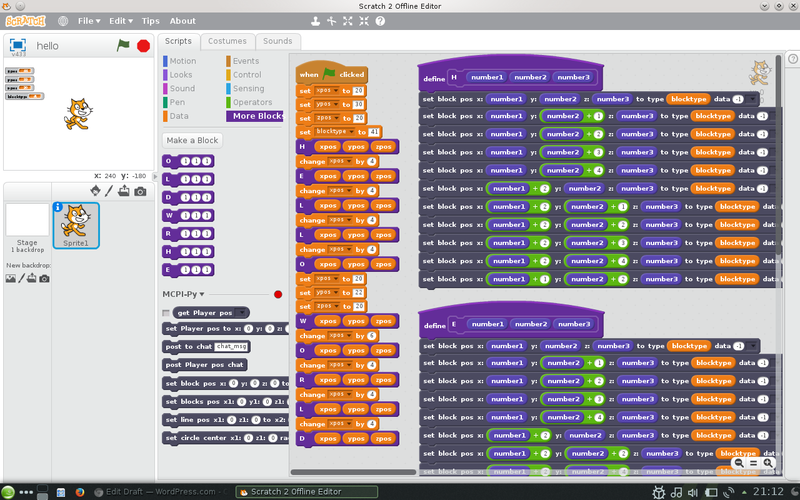 This post for the Naas-Sallins CoderDojo is about making music by writing code using Earsketch. There are lots of fantastic instructions on the website including a section for teachers. I strongly suggest that you have a look at the documentation but sometimes it’s fun just to jump straight in and see what we can make. Earsketch Online supports Chrome, Firefox and Safari so using one of those browsers lets get started by clicking here. 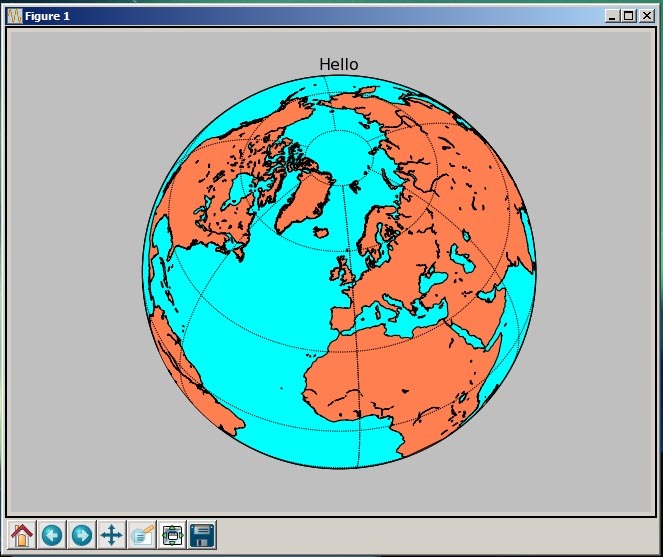 The Earsketch window has 4 main areas and looks like this. Sound selection: Here you can sample the different sounds available for making music. Expand each list and click on a play icon to hear what it sounds like. Message Console: Error messages and other information is displayed here. 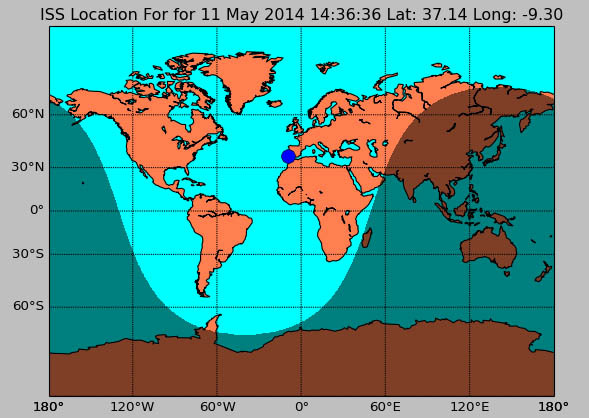 Sound Window: A graphical representation of your music is shown in this area. So lets jump in and make some Noise! It is a good idea to define each sound type that you intend to use at the top of your code so that if you change your mind about it you only have to change your code in one place. Now that we have defined our intro lets figure out how to play it. fitMedia(sound, track, start playing, stop playing) The start and stop time are defined in measures. A measure of music is a block of time defined by a specified number of beats. In the EarSketch environment, a measure is always defined by four beats. 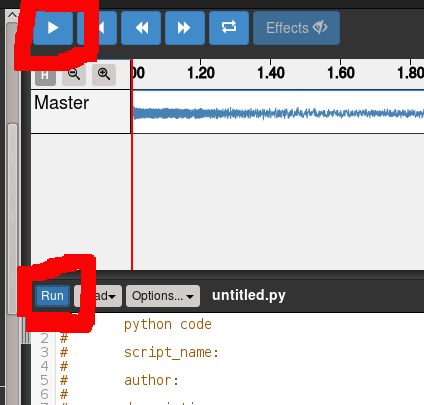 To see if this works click on the run button and if everything goes ok click on the play button in the sound window. Any errors will be shown in the console. Next we are going to add a lead, but we are going to use two different sounds. It’s fun messing around to see what fits together but in this case I have changed the code to define MyLead_1 & MyLead_2. You can see from our fitMedia commands that I switch to MyLead_2 for 10 measures and switch back at measure 17 and we run this on track 2. Next I want add a custom user sound. You can record your own voice, or like me you can use a text 2 voice service. The audio needs to be in wav format so you may need to convert it using an online media converter or a windows program like this. You will need to be logged in to Earsketch to upload your file, when you are click on upload new sounds at the top of the sound selection window and enter the details into the dialog box. 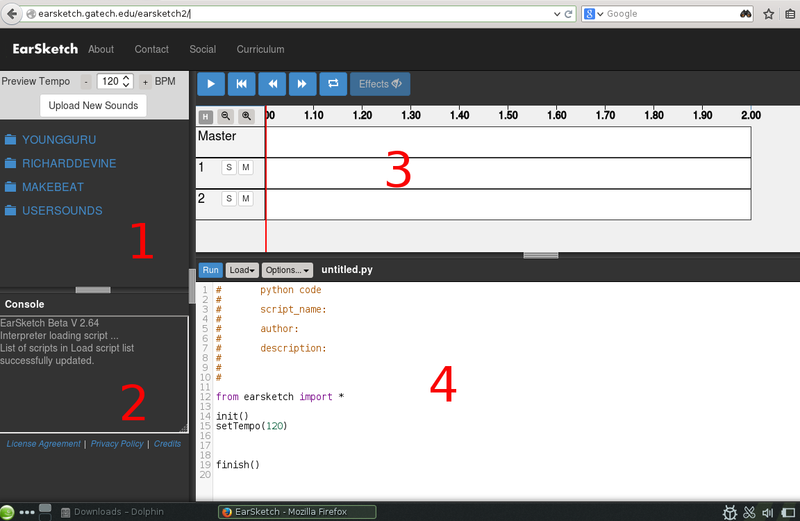 In this case I decided to use my coderdojo sound with the makeBeat command. There are plenty of details in the documents but to be honest I copied an example and then messed around with it. I use a for loop that goes from 11 to 16 in steps of 2 to play this sound at those points. The beat = “0++00-00-0+++0+0++++++” string controls how the sound is played. You can download an mp3 of your tune by selecting to do so from the options button above the code window. Finally I would again suggest that you should have a look at the Earsketch Website which really has great quality instructions.